This is the real story of the Beatles’ harrowing rise to fame: focusing on that 7-year stretch from the time the boys met as teenagers in the 50’s to early 1964, when the Fab Four prepared to invade America. From the boys’ humble beginnings in Liverpool, to the cellars of Hamburg, When They Were Boys includes stories never before told, including heartbreaks, lucky breaks, and the dramatic twists of timing, fate, loyalty, and betrayal. 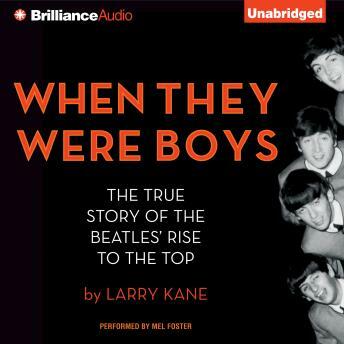 Included are an eyewitness account of that first meeting between Lennon and McCartney, the inside story of how Ringo replaced Pete Best, an exploration of the brilliant but troubled soul of manager Brian Epstein, the real scoop on their disastrous first visit to Germany and the death of Stu Sutcliffe. With an eye for life in Liverpool during the 50’s and 60’s, and with the help of his own conversations with the Beatles in the early years, Larry Kane brings to life the evolution of the group that changed music forever.